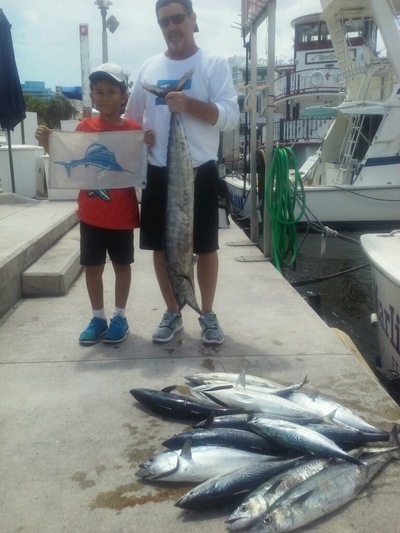 Our fishing charters here in Fort Lauderdale continue to provide good action for our anglers. Sea conditions have been less than three feet on most days and the rain has left us alone out over the ocean. Some storms occasionally inland but that doesn’t affect us out here on the beach and offshore and it has been mostly very bright and warm once again with 90 being the high again today. There continue to be some Sailfish around but it has slowed down from our last report. But there are still some in the area. When you can find them they continue to be very aggressive on the baits. There have been the summer Kingfish on the reefs and the Bonito (Little Tunny) are there as well, occasionally thick with them some days now. We expect this to continue throughout the upcoming week. Blackfin Tuna are taking small baits, and not all those Blackfin Tunas are small fish, but they are focusing on small baitfish and mostly found in lightly scattered weed lately. On the bottom some nice sized Amberjacks continue to be available on wrecks and structure. The Vermillion Snapper are biting and most are happily of legal size. Tilefish available too. We have actually seen an improvement in the Mahi-Mahi fishing but it remains off from what everyone would like to see. There are some Wahoo showing just off the reef line with the big moon right now. Some of these Hoos are a bit larger than our normal ones as there are a lot of Bonito for them to choose from for a good meal.